A warm, freshly baked loaf is so deluxe, and it’s something you can make with your own hands in your own home with simple ingredients. Bread making is such a pleasurable pastime with so many rewards — even money saving ones — but it can be a little tricky to turn out a good loaf. You have to develop the gluten in the dough so it aligns into a network that’s elastic and capable of holding a large volume of air. If this doesn’t happen, bread comes out dense and dry. Traditionally, stretching and aligning the gluten has been done by hand kneading — as much as ten minutes in some recipes. Electric mixers can do the kneading, but these come with hefty price tags, storage space issues, and more of a carbon footprint — and they don’t even save you time. 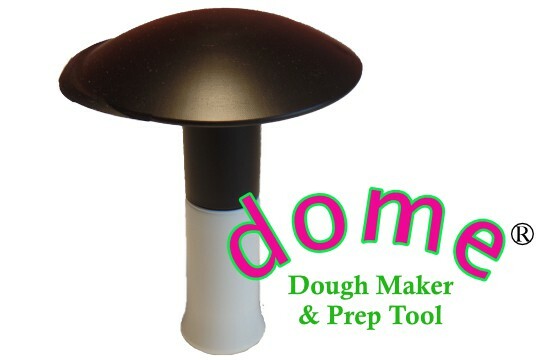 But now there’s the dome® a simple hand tool that helps you do all the kneading in one minute. These two loaves of bread were made with the same recipe in the same place with the same proofing steps for the same proofing time. The bread on the bottom was kneaded by hand for ten minutes. The bread on the top was kneaded for one minute with the dome. 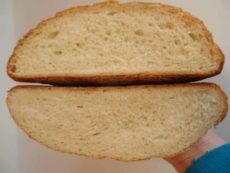 The dome-kneaded loaf rose higher and produced a more open crumb with less work, less time and less cleanup. The dome has the perfect domed shape for stretching and aligning gluten because it pushes and drags a wide swath of dough at a time, giving it a good stretch radially, in all directions. You work in a bowl and smear the dough and turn the bowl and smear again. 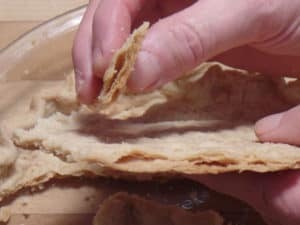 It’s so effective that you only have to work the dough for one minute to thoroughly stretch the gluten into an elastic and extensible (strong and stretchy) network. You don’t have to question whether you’ve worked the dough too much or too little; just one minute is sufficient to create the structure that will let your bread rise well. 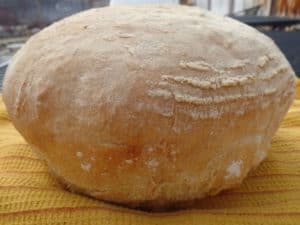 The dome is the hands down easiest way to make sour dough bread and other high hydration (sticky) doughs, giving them greater structure and dough strength for better shaping. The dome is perfect for mixing slower, no-knead bread dough. 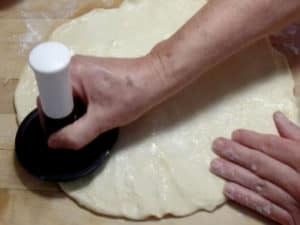 You gently stir and fold the ingredients with a lifting motion that stacks the dough upward, so the gluten strands align themselves naturally taller. Then you allow the dough to slowly proof. The dome® helps with other aspects of bread making too. Place a little oil on the dome to help stretch out pizza dough thin enough for a Neapolitan style pizza. And since the dome has a bladed section, it’s a great bowl scraper, and cuts dough too. Ready for Some Baking Adventure? We’re Here To Show You Around. There are so many wonderful kinds of bread to make. 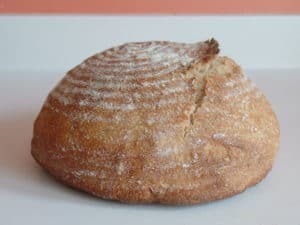 Once your dough has risen, you can shape it into your choice of a great variety of breads from around the world: standard loaves, boules, baguettes, pizzas, bagels, pitas, braids, rolls, flat breads, coffee cakes, and more. Each kind is a fun and rewarding adventure. Baking bread is good for the soul, a treat for the people in your life you break bread with, and a pleasurable and creative handcraft. The dome pretty much guarantees success with it. Click here to subscribe to Domestic Bliss, our monthly blog, and receive notifications of our newest techniques and recipes. We have vegan recipes too. We test them all to keep them simple and streamlined without unnecessary steps. Need an example? 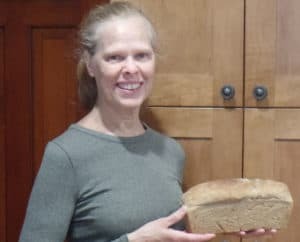 Watch our short video on the Video & Recipes tab to see how simple it is to make a healthy, hearty loaf of whole wheat bread. Piecrust & Pastry: The dome spreads cold butter chunks into sheets of butter in the flour mixture. What happens when you do this? You get a crust that bakes up crisp and very, very flaky. 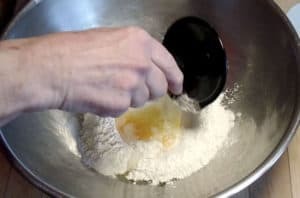 After you’ve cut up the butter in the flour with the dome’s blade or with a food processor — but before you add any water — you smear the butter/flour mixture in a bowl with the dome to create flour-coated sheets of butter. When the butter melts and water evaporates during baking, empty air pockets create layers of crusty flakiness for a very special pie. It works well with vegan “butters” for flaky non-dairy piecrusts and pastry too. Cookies: The dome is perfect for blending thick cookie dough efficiently. You push the ingredients in the bowl instead of stirring, so it’s easier on the wrist. And it can lend greater flakiness to bar cookies such as lemon squares when you spread pieces of butter in the flour into sheets. 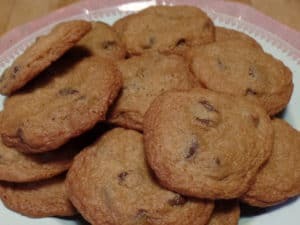 The dome is great for making vegan cookies, because it lets you do the stiff and heavy mixing before adding liquid, so cookies will stay tender instead of activating the gluten with liquid prematurely. Pasta: Make pasta dough in half the time. The dome pushes the flour and eggs together against the sides and bottom of a bowl to press the mixture into dough. The ingredients are confined in a close space so it’s a more effective method than egg-coated hands chasing flour on a counter. Cleanup is easier too. This tool helps vegan pasta hold together by developing the gluten in the flour, so no egg is needed. Gnocchi: Make gnocchi dough in a few minutes. Either rice the potatoes through a colander with the dome or mash the potatoes directly with the dome, then add the flour to the same bowl to make the gnocchi. Working in a bowl keeps the ingredients confined in a close space so it’s more efficient, and focused, and cleanup is easier. When making vegan gnocchi, smear the gnocchi dough with the dome to stretch the gluten in the flour tthat will hold the gnocchi together without the addition of egg. Fritters: Add some white or whole wheat flour to a fritters mixture and smear it with the dome to add a gluten network and lend greater cohesion to fritters of all types — eggless vegan fritters too. The dome does so many other kitchen jobs. It crushes nuts — even almonds — into small pieces, pulverizes spices on a flat surface without a mortar and pestle, flattens cuts of meat and other foods, and it’s a safe tool for making pastes, such as garlic and salt paste. 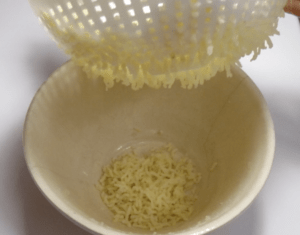 Pair it with a colander or sieve and it’s a food mill. The dome forces food through the holes of a colander for purées, sauces, soups, baby food, and more. Don’t make gazpacho soup in a blender; it gets too frothy. 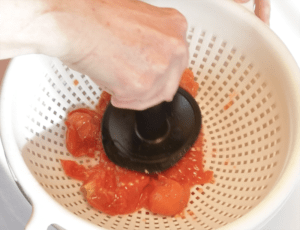 Press ripe tomatoes through a colander instead, you won’t even have to remove their skins. It’s a potato ricer too. Press cooked potatoes through a colander for lots of creamy, lump-free mashed potatoes. Squeeze out excess liquid from hot cooked spinach and other greens, fritters, salted cucumber, eggplant and more. 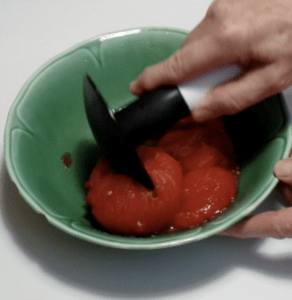 The blade of the dome can also cut cooked vegetables and ripe juicy tomatoes and fruits in a bowl so the juice stays in the bowl instead of running onto the counter. Make fresh tomato or peach or watermelon salsa. And this one simple tool that does all these kitchen jobs costs only $12.95. That’s less than the cost of just 3 loaves of bread. And measure that price against the cost of all the tools you won’t have to buy when you own the dome to appreciate what a great value it is. 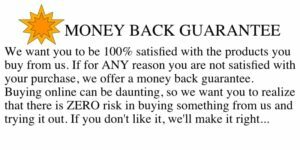 The total potential savings is anywhere from $55 to $195. You won’t need a food mill — a potential savings of $22 to $94. You won’t need a pastry blender — a potential savings of $6 to $17. You won’t need a bowl scraper — a potential savings of $5 to $10. You won’t need a mortar and pestle — a potential savings of $12 to $36. You won’t need a potato ricer — a potential savings of $10 to $38. It’s Patented and Made in the U.S.A.